From Hasbro Studios comes an all-new series of exciting adventures for Optimus Prime and his team of Autobots as they battle against their archenemies the Decepticons. Prepare to be blown away by the Autobots and Decepticons, in Transformers Prime Beast Hunters -Series 3, Volume 2- Race for Salvation, on DVD and Digital Download from 1st June. In this volume, the Decepticons battle the Autobots for control of fossilized Predacon bones. The Decepticons plan to use the bones to clone a nation of savage Predacons and unleash fear and terror onto the earth. Will the Autobots be able to defeat their arch rivals in time and save our planet? Find out in Transformers Prime Beast Hunters -Series 3, Volume 2- Race for Salvation. 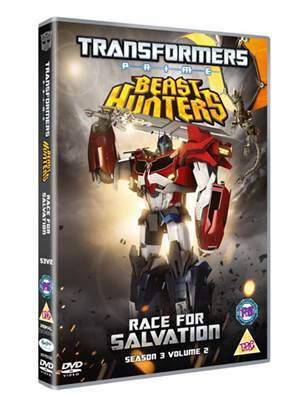 Transformers Prime - Beast Hunters Series Prime 3, Volume 2- Race for Salvation, DVD is unleashed on shelves from 1st June 2015. To be in with the chance of winning a copy all you simply need to do is enter the rafflectopter below. Good Luck!